One particular buffet restaurant that never fails to impress is Edge at Pan Pacific Singapore. This festive season, revel in a merry splendour as you savour glorious wintertime roasts alongside a plethora of other international and Asian dishes across 7 live stations and not to be missed is their massive dessert station that is housed within a structure constructed entirely out of edible gingerbread. 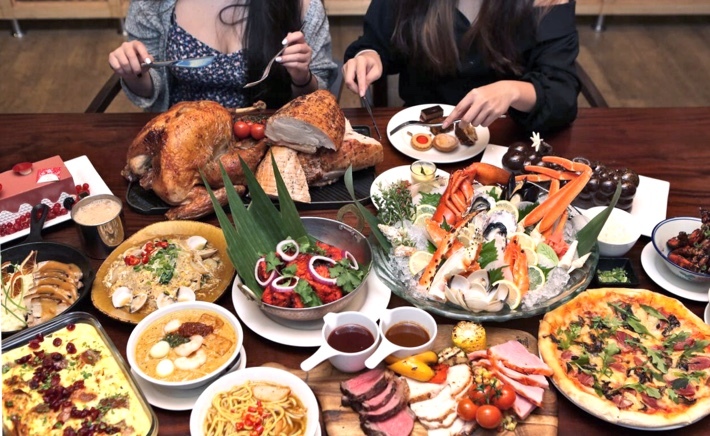 Happening from 12 November 2018 until New Year’s Eve, this buffet only gets better—our readers can quote ‘ladyironchef’ upon making a reservation to enjoy 20% off Festive Lunch and Dinner Buffet from 19 November 2018 to 30 December 2018 (excluding eve of PH, PH and Sunday Champagne Brunches). Child prices are applicable for children aged six to 12 years old. Prices quoted are subject to 10% service charge and prevailing Goods & Services tax unless otherwise stated. 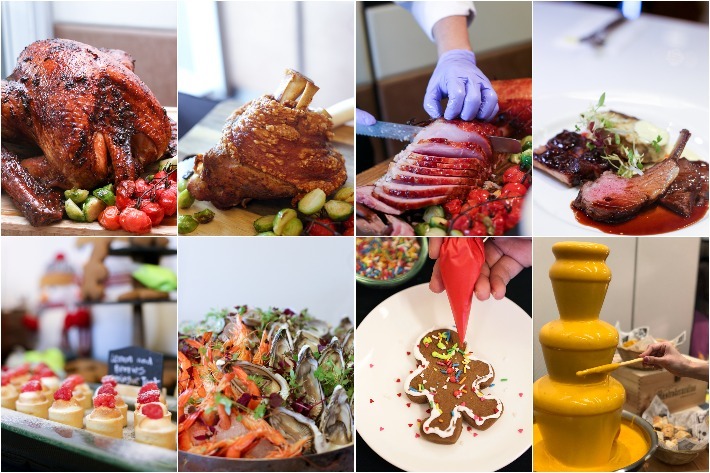 This year, Novotel Singapore on Stevens and Mercure Singapore on Stevens are pulling out all the stops to offer a series of hearty and stunning Christmas time classics such as their Honey Studded Gammon Ham, Salmon Coulibiac (this one’s a must-try!) and not forgetting their Traditional Roast Turkey—all of which are available for takeaway via Fudebar or dine-in at Food Exchange. Their Festive Takeaway and Festive Buffet starts on the 15th of November 2018 and will go on until the 31st of December. Remember to book before 14th December 2018 to enjoy a 25% Early Bird Discount off Buffet at Food Exchange. All prices are inclusive of service charge and government taxes. Delivery charge of $30 per location applies. Complimentary delivery for orders $200 and above. All orders must be made at least 24 hours in advance. To book a table, visit www.foodexchange.sg. Drawing inspiration from Singapore’s culturally-rich enclaves with many dishes possessing nuances of Asian flavours such as their Rock Lobster Bouillabaisse and Gula Melaka Log Cake with Coconut Flakes so expect a wide range of exciting (and enticing) dishes fit for a solid Yuletide feast over at GINGER at PARKROYAL on Beach Road. From 1st December 2018 to 1st January 2019, our readers can quote ‘ladyironchef‘ upon making a reservation to enjoy this lavish buffet spread at 25% discount (exclude blackout dates), and 15% discount on Christmas Eve, Christmas Day, New Year’s Eve and New Year’s Day. From Festive buffets, Chinese Festive Set Menu to Festive Takeaway Delights, luxuriate in new items specially curated by the team of chefs from their hotel’s restaurants Spice Brasserie and Si Chuan Dou Hua Restaurant. 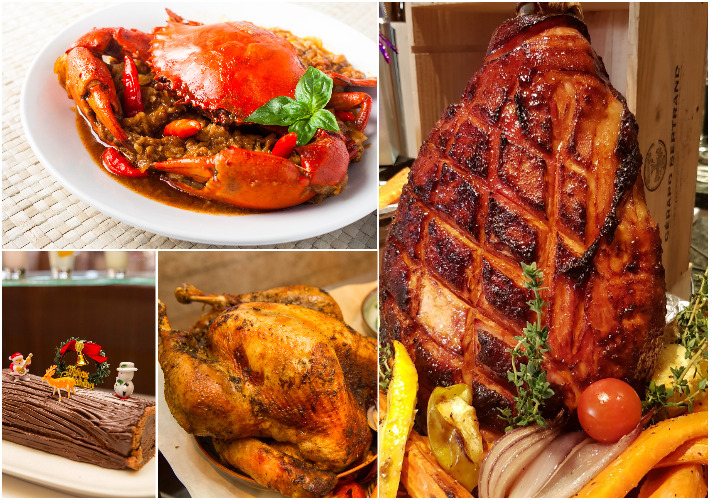 From the former, indulge in the likes of their Pan Seared Honey Baked Ham with Pineapple Glaze Sauce and Brandy Crab Bisque, and from the latter, the crowd-favourite Suckling Pig that will available in their Festive Takeaway Menu. Regardless the venue of your year-end party, there is always a reason to celebrate. 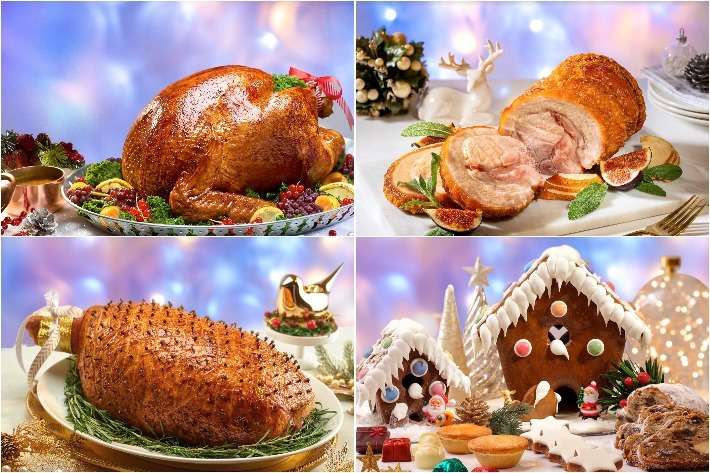 Festive buffets at Spice Brasserie starts from S$48 per person and Festive Takeaways starts from S$6 to S$108 per item. Citibank, DBS, Standard Chartered and UOB cardmembers enjoy 15% savings. Terms apply. Watch the flavourful magic of Christmas come to life in an enticing festive feast featuring over 40 scrumptious Yuletide dishes at Royale’s Santa’s Christmas Circus Festive Buffet. Gracing this year’s buffet line is their glorious Truffle Cheese Fondue, a selection of show-stopping roast meat delights, a Live Outdoor BBQ station and even DIY gingerbread men over at their kid’s playroom for your little ones to get creative with. 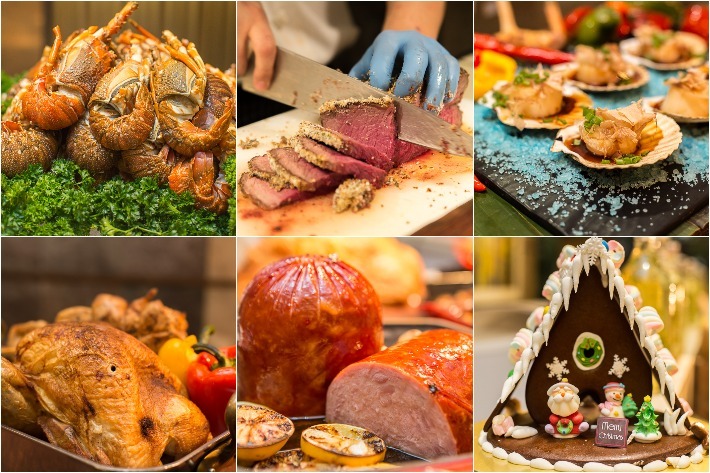 For the extra star on top of the tree, our readers can quote ‘ladyironchef’ for 25% off Royale’s festive dinner buffet at only S$36++ per pax for lunch buffet and S$51 per pax for dinner buffet (valid every day except for Christmas Eve and New Year’s Eve). 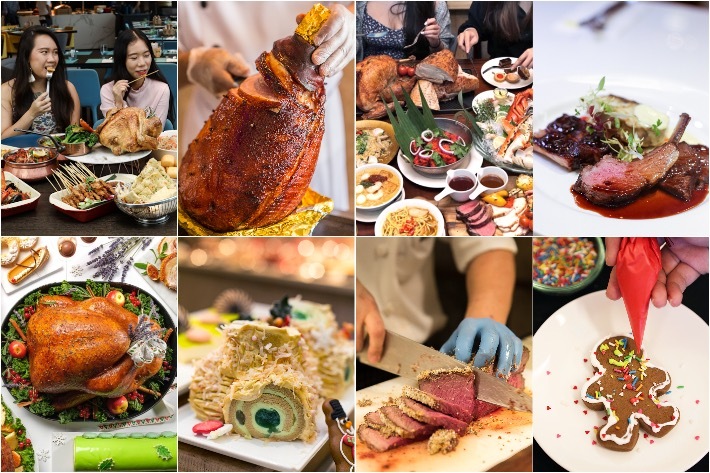 In this season of good tidings, Singapore Marriott Tang Plaza Hotel invites you to relax and indulge yourselves with a line-up of spellbinding and gastronomic experiences. Tuck into a festive medley of perennial classics such as Roast Turkey with Chestnut Bread Stuffing, Roast Duck Breast with Apricot and Orange Glaze as well as Pan-Fried Duck Foie Gras—available on both Christmas Eve and Christmas day. 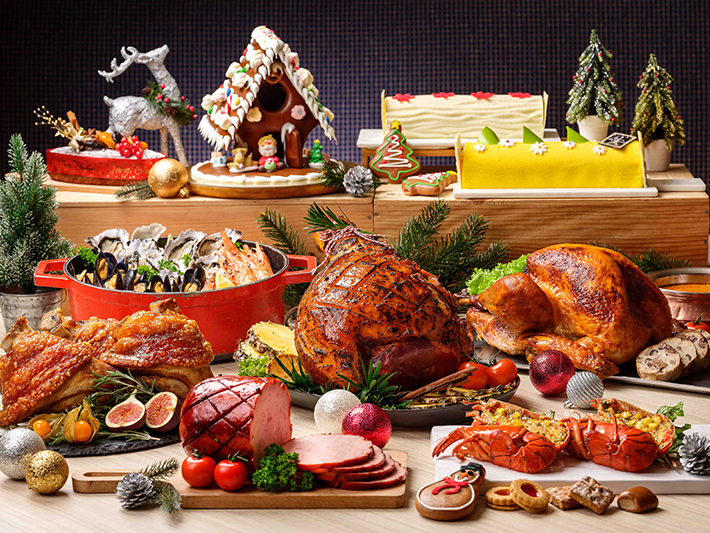 From 22 November to 25 December 2018, these Yuletide goodies are available for takeaway at www.singaporemarriott.com/christmas or at Singapore Marriott Tang Plaza Hotel’s Forecourt Stall (by the hotel entrance). Orders have to be placed at least 3 working days in advance. All prices stated above are subject to 10% service charge and 7% Goods & Services Tax (GST) unless otherwise stated. 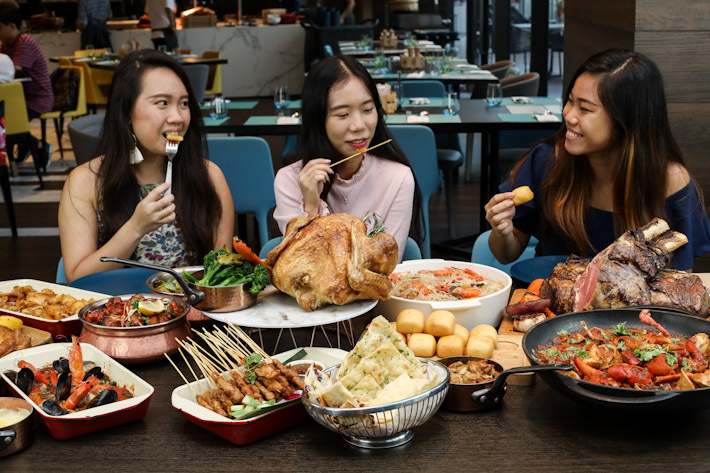 This festive season, The Square Restaurant over at Novotel Singapore Clarke Quay will feature an all-rounded buffet line-up that will not only include an array of stellar wintertime roasts but also a repertoire of Asian favourites which includes their DIY Laksa—a serious crowdpleaser—, all starting from S$38.40++! And to top it all off, from 1st until 31st December 2018, our readers may quote ‘ladyironchef20′ to enjoy 20% off this very festive buffet spread—now that’s a steal. Prices are subject to 10% service charge and thereafter 7% GST. Menus will be on rotation and buffet items may be subject to change. I tried to use the LadyIron chef promotion at Ginger for the Christmas Eve buffet. However they said it was no longer valid. I was hoping to use it and was disappointed I was unable.